The two Casa Capena properties are owned by Juliet, who works as a translator and lives in Cardiff, Wales. Juliet first visited Capena in her twenties while working in Rome, fell in love with the village and lived there for three years. Some years later, she took her two small sons back for a nostalgic visit and received such a warm welcome from her former neighbours that she has been a regular visitor ever since, spending around two months each year in Capena. Stefania lives very near the Casa Capena properties and can assist guests whenever she may be needed. Stefania’s mobile (cell) phone number is included in the Casa Capena information pack, which you will receive on confirmation of your booking. The pack can be sent to you as a PDF, or in printed form – or even as a Kindle booklet! 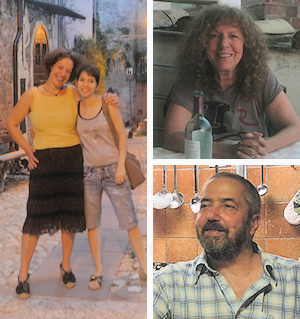 The other key members of the Casa Capena team are Rosalia and Debora, who keep the properties clean, and Stefano, a local handyman who does everything from getting the internet going to mending the plumbing. In the picture at the bottom right, Stefano is shown relaxing in the kitchen of his own home, where he excels as a cook. Both the properties were refurbished by resident artisan Mimmo, working with his brother Comilvio.